In two days, Zynga has hit the $500k mark in a charity campaign that launched late Sunday on FarmVille for the “L’Ecole de Choix,” a K-12 school the gaming giant is building in Mirebalais, Haiti. Farmville players can donate money directly by purchasing Sweet Seeds for a special beet that won’t wither. In addition, Zynga is making a corporate donation if players reach a community goal. Every FarmVille player was given a Haiti Backpack, and players can exchange School Supplies (free gifts) to fill the backpack. 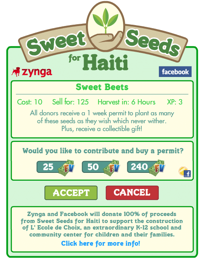 If players exchange 400 million gifts, Zynga will donate $100K to the charity, in addition to the funds donated for the Sweet Seeds. So far, the initiative has resulted in 200 million gifts exchanged. Zynga is donating 100 percent of the proceeds for this campaign to the school, and Facebook has also agreed to donate their Facebook Credits fees as well. It’s an impressive amount of money to raise (not to mention interactions) in such a short time. Zynga says that this is one of the most popular campaigns the company has ever run, second only to its Earthquake Relief Campaign, which raised over $1 million in five days on Farmville. Zynga’s fundraising goal is is to generate enough donations to complete building the school and provide 1 year of operating funds. The campaign for the next 10-14 days depending on how much money players are able to raise.